Sandy Spurgeon McDaniel, a longtime expert in child development and former parenting columnist for the Orange County Register, offers free parenting classes at Carden Hall in Newport Beach November 13, 1:00 to 3:00 p.m. (Grades Pre-K–3) and November 15, 1:00 to 3:00 p.m. (Grades 4–8). Her lecture titled The 4 Rs of Parenting provides insights about how to raise reliable, respectable, responsible, resilient kids with simple key learning. McDaniel’s seminar is based on her book, Don’t Feed the Dragon! McDaniel has also launched parentingSOS.com and is the author of Don’t Feed the Dragon, Recipes from Parenting, and Leave Your Baggage at the Door, and co-author of Project Self-Esteem which will be available for purchase after the seminar. 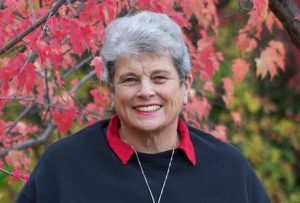 McDaniel has successfully raised two children and brings over 50 years of experience in the field of child development. The lecture series is being held in room 24 at Carden Hall located at 1541 Monrovia Ave, Newport Beach, CA 92663.
Credit: Virginia Chavez | Publicist. Spreading reading happiness to communities across the nation, this unique traveling exhibit is an interactive experience to learn about and try ebooks and audiobooks available at libraries in California. 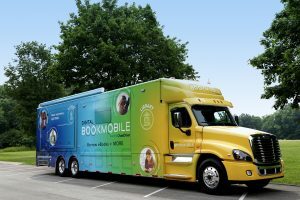 The Digital Bookmobile presents library lovers of all ages with an interactive experience exploring the digital services available at public libraries in the San Pedro area. Equipped with interactive workstations, touchscreen activities, devices to sample titles and more, the Digital Bookmobile has everything a reader needs get started browsing the library’s digital catalog of ebooks and audiobooks. Library staff and eReading experts will be available on the Digital Bookmobile to guide visitors through the easy process. Interactive learning stations feature video tutorials that introduce readers to the seamless process of browsing and borrowing digital books. The Gadget Gallery is filled with popular devices, including iPhone®, iPad®, Android™ phones and tablets, Chromebook™ and Kindle®, for visitors to browse the library’s digital service. Tours are free and open to the community. View full schedule at digitalbookmobile.com. Readers with a valid library card can borrow their favorite titles 24/7 by visiting https://lapl.overdrive.com by downloading OverDrive’s newest reading app, Libby. When: Saturday, November 10 – 11AM-5PM. The 42-foot long traveling exhibit provides devices, internet connectivity and expert guidance to the local library’s digital collection of ebooks and audiobooks. This traveling exhibit first launched in 2008 in Central Park, New York, and has since traveled more than 200,000 miles and welcomed over 200,000 visitors at 900 events. For images and more information, visit www.digitalbookmobile.com. To browse libraries, ebooks and more, visit www.overdrive.com.